How to Play Blu-ray on Wii U? The Disc Could not be read. Actually, Wii U can’t support the Blu-ray disc playback due to patent licensing fees., even you put the Blu-ray disc on the right side, you will get the message too. Nevertheless, it does not mean that it’s impossible to play Blu-ray on Wii U. In fact, you can still play Blu-ray on Wii with ease as long as you can get the correct method, We know that Wii-U equips a modified Blu-ray drive, there is a “hidden function” to stream MP4 video from computer to Wii-U. You can rip the Blu-ray and get the friendly video for Wii U. This post will tell you the effective solution. First, you need one Blu-ray ripper which can rip and convert the Blu-ray to your Wii U desired video format: MP4 video. I think you may like the Pavtube ByteCopy, you are able to copy and rip both non-protected and commercial DVDs, Blu-ray to Wii U-accepted format in one stop with high quality and fast speed in customized video size. (Read review), you even can play any DVD and Blu-ray on Wii. Even you are a PC beginner, you can love this tool within 3 minutes. Supports 250+ video, audio output formats and devices, therefore, you can directly rip DVD/Blu-ray to PS3, Xbox 360, TV, Sony Xperia Z6 Compact, PS4 Pro, etc. DVD to 3D conversion: Create 3D videos from DVD to play on 3D Players, Gear VR, VR One, Rift DK2, etc. 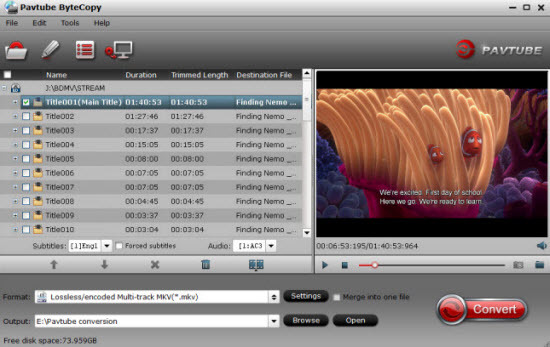 Editing function: It provides full editing functions of trimming, cropping, watermark/subtitle adding. Output settings: Not only the default but more settings to customize: bit rate, resolution, frame rate, sample rate, etc. Insert the Blu-ray disc on your PC. After you download and install this perfect Blu-ray ripper, launch it. On the home interface, click the disc icon to import your Blu-ray movies, you also can darg the Blu-ray to your interface directly. By the way, this Blu-ray ripper allows users to set subtitles for easy enjoying. Click on the drop down menu of “Format” and you can select “H.264 High Profile Video(*.mp4)” or “H.264 HD Video(*.mp4)” from “Common Video” and “HD Video”. You have other game console and you can get the best video formats for them too, like the DVD to PS4 Pro, Xbox One, Xbox 360, PS4, etc. Tip 1: For Wii, you can choose “Wii”. From the sub-list, you can choose “Wii AVI Video (*.avi)”, “Wii MOV Video (*.mov)” as the target format for your Wii. For Wii U. Tip 2: If the default video/parameters can’t meet your needs, just click Settings icon to adjust the video codec, bitrate, frame rate, audio sample rate, etc to get a decent video as you want. After all necessary settings, you can hit the “Start conversion” to start converting Blu-ray with best video settings for Wii U. Once the conversion finished, click “Open” in main interface to quick locate the converted video. Then, you can transfer or stream the converted movies to play with Wii (U). This step is a little complicated, you can read the this post: Stream Any Local Videos to Wii U through Plex Media Server to get the detailed information and steps. For many Wii U beginners, you may have many other troubles on Wii U, we have collected the most Wii U issues for you, hope the following information may be useful for you. Q 1: Can you use Nintendo eShop funds on both Wii U and Nintendo 3DS systems? A: Yes. You can use the same funds on both systems if they are linked to the Nintendo eShop with the same Nintendo Network ID. Please visit this page for more information. Q 2: Most valuable Wii U games? Q 3: Does Wii U play DVD or Blu-Ray discs? A: No. The Wii U console does not play DVDs or Blu-Ray discs, but Wii U offers access to video-on-demand services* such as Netflix, Amazon Instant Video, Hulu Plus, and YouTube. Q 4: If I delete a game on my Wii U, will I be able to download it again? A: Yes. On the system where you made the initial purchase, you can re-download a deleted game (as long as it’s still available in the eShop) by going to your profile in the Nintendo eShop Menu and selecting My Downloads.